The iconic company on Friday said it would quit making desktop inkjet printers and focus on churning out ink for the millions of printers it already has sold. That abrupt about-face comes after Kodak has spent nearly a decade and many hundreds of millions of dollars to create the printers, which it started selling in 2007. Now the printers will join other Kodak operations, such as retail store photo kiosks and document scanners, that within the past few weeks quickly went from being part of the company’s future to a once-was. In place of desktop printers, Kodak has said “functional printing” — using printing technology as a way of manufacturing everything from circuit boards to flat batteries — will be key to its post-bankruptcy plans. Red River Paper introduces 66lb. Polar Pearl Metallic photo inkjet paper. The new Polar Pearl Metallic is a truly unique inkjet paper that closely matches the look of photo lab metallic prints. Polar Pearl Metallic features the same aspects as its lab equivalent – a high gloss finish and a pearlescent base stock that yields an elegant iridescence in your images. Dallas, TX (PRWEB) March 26, 2010 — Red River Paper introduces 66lb. Polar Pearl Metallic photo inkjet paper. The new Polar Pearl Metallic is a truly unique inkjet paper that closely matches the look of photo lab metallic prints. Polar Pearl Metallic features the same aspects as its lab equivalent – a high gloss finish and a pearlescent base stock that yields an elegant iridescence in your images. The new paper is compatible with any inkjet printer and requires no special equipment, inks, or finishing techniques to achieve the metallic effect. Polar Pearl Metallic is part of Red River’s Polar family of products, which represent the absolute state-of-the-art in photo inkjet papers. Kodak™ and their Endura™ Metallic process for photo labs originally made the metallic style print popular. After a number of years of research and development the same look and effect has been created for inkjet printing technology. Drew Hendrix, Vice President of Red River Paper notes, "The lustrous nature of Polar Pearl Metallic adds special depth and life to many different types of photography. The new paper expands the creative freedom and capability of inkjet users from the professional to the enthusiast level." The lustrous nature of Polar Pearl Metallic adds special depth and life to many different types of photography. The new paper expands the creative freedom and capability of inkjet users from the professional to the enthusiast level. 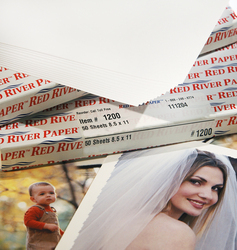 Red River Paper was founded in 1997 and has become a trusted supplier of premium photographic inkjet papers to a wide variety of customers around the world. The company offers products that match or exceed retail brand quality with a savings as much as 40%. Kodak and Endura are registered trademarks of Kodak, Inc.
HP is challenging Kodak’s promises that consumers can save money by purchasing a Kodak printer. Who should you believe? According to HP and an independent consulting firm, consumers would have to print four pages per day to save that much money with a Kodak printer–far more than most home users actually do. Last year HP lodged a grievance against the Kodak ads. In December, the Federal Trade Commission ruled that Kodak could continue the advertising campaign if it slightly changed the wording. As a result, Kodak’s revised ad copy now reads: "Save on average $110 per year on ink based on just four pages per day." In fact, few consumers would ever achieve the promised cost savings. "You have to be printing 1500 pages per year–well above average for most people–to get the $110 savings that Kodak claims," Lippman says. Of course there is a way to save on ink, and to measure the results yourself. Buy your supplies from Metawatch, and compare the prices of Original (OEM) products for the same quantity you purchased from us per year. Sure to bring a smile to your face…No duff, no promises, just plain results.Thank you for shopping at Metawatch Inkjet Supplies. California electronics heavyweight HP and underdog Eastman Kodak Co. are in a marketing brawl. Round One went to Kodak, which launched its All-in-One inkjet printer line in 2007, when it started comparing its printing cost per page to companies such as HP and Canon Inc. in a “Print and Prosper” advertising campaign. Now, in Round Two, Hewlett-Packard is punching back with a marketing campaign of its own. HP cites its own statistics to claim that Kodak’s savings fall short of what’s promised and that Kodak has no printer cartridge recycling program. The campaign also points out that users of an HP inkjet printer have to replace only one color cartridge when that color runs out, while the Kodak printers — which use an ink manufactured at Eastman Business Park — have all the color inks in one $15 cartridge, so if one color runs out, all the colors need replacing. And HP takes a shot at Kodak by pointing out that Moody’s, the credit rating agency, has said there is a chance Kodak could face bankruptcy while HP was recently lauded in Fortune magazine. Kodak and HP have a tangled history. Kodak CEO Antonio M. Perez came to the company in 2001 after a long career as a Hewlett-Packard executive. HP, meanwhile, is the king of the jungle in the desktop inkjet world, commanding close to 50 percent of the market worldwide, said Tom Ashley, director of digital printing consulting firm Pivotal Resources USA. Kodak hopes to ship around 1 million All-in-One printers this year — which would represent perhaps 2 percent of the industry’s sales. The company’s printers seem to have better penetration with people who do lots of high-end printing such as photographs, meaning more ink cartridges sold, Ashley said. HP “is still the market leader, but it sounded like Kodak must be making real inroads if you feel obliged to knock them like that,” Ashley said.